Harold (Ben Cooper) follows Lynn (Marla English) around his mom's motel like a doe-eyed puppy. Who can blame the kid? This nightclub singer is a dead ringer for Liz Taylor, after all. She's also the honeypot for a gang of thieves, and Harold's teenage crush quickly lands him in the middle of an armored car heist. Al (Jan Merlin) has all the angles worked out, leaving the cops a trail of breadcrumbs pointing to a former partner who just busted out of the clink. Anyone who knows enough to testify otherwise is shot dead. 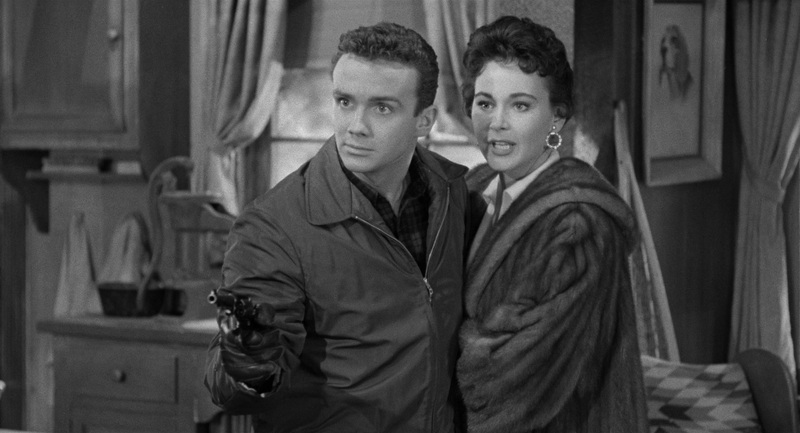 The scheme might've gone off without a hitch if he and Phil (Nick Adams) hadn't forced a teenage boy at gunpoint to be their getaway driver. A worried mother calls the cops thinking that her underage kid was trying to elope with Lynn, and Harold's souped-up Mercury is a one-of-a-kind that anyone who knows the guy could spot a mile away. The noose tightens. The body count rises. A frantic detour unexpectedly leads them to the perfect place to lay low. Terry (Joan Evans) tries to give them a friendly warning in time. Once the first flakes of snow touch down, these roads will be completely impassable for five full months. Of course, if you've just gunned down a cop and made off with the modern equivalent of a million dollars, being snowbound in the mountains till Spring allows for plenty of time for the heat to cool down. Terry's older brother Luther (Peter Miller) lives up here in the mountains with her, and they have plenty of food and supplies to make it through the winter, even with four uninvited guests in tow. Three seasoned criminals. Three hostages. No chance of escape. It's not altogether surprising that A Strange Adventure has languished in obscurity for so many decades. It's an instantly disposable noir, devoid of any tension or suspense. There are no standout setpieces or arresting visuals. Despite the fact that its runtime doesn't even break the 70 minute mark, there's no real urgency to speak of. The same handful of people generally stand around the same couple of rooms, talking interminably and occasionally waving a gun around. There's an almost literally ticking clock to deal with – if Luther doesn't radio back to his colleagues twice a week, the power company will dispatch someone to investigate – but despite many attempts, it doesn't generate all that much in the way of intrigue. I appreciate the hostages' ingenuity, and there's a Chekhov's Gun twist that's smartly crafted and genuinely caught me off-guard. Alas, that's not nearly enough to salvage a slow, uninvolving thriller-in-sarcastic-quotes. Bizarrely, it seems as if A Strange Adventure either ran out of time or money. The film sets up a desperate scenario in its final moments – one in which the righteous are to be punished while one of their tormentors gets a wildly profitable last laugh – and then completely leapfrogs over it. Not only do we not get to see how things play out, what little exposition the finalé bothers with still doesn't really explain it. Maybe someone in production realized they were heading down a completely anticlimactic road and were just trying to breeze through it as quickly as possible. Whatever happened, it's a rancid cherry atop an already indigestable sundae. It's not strange. It barely rates as an adventure. I appreciate Kino Lorber's commitment to bringing so many films noir to Blu-ray, but a forgettable thriller-without-thrills like A Strange Adventure is only for the most ardent noir enthusiasts. Rent It. Aggressively mediocre though A Strange Adventure may be as a film, its visual presentation stands on the brink of perfection. 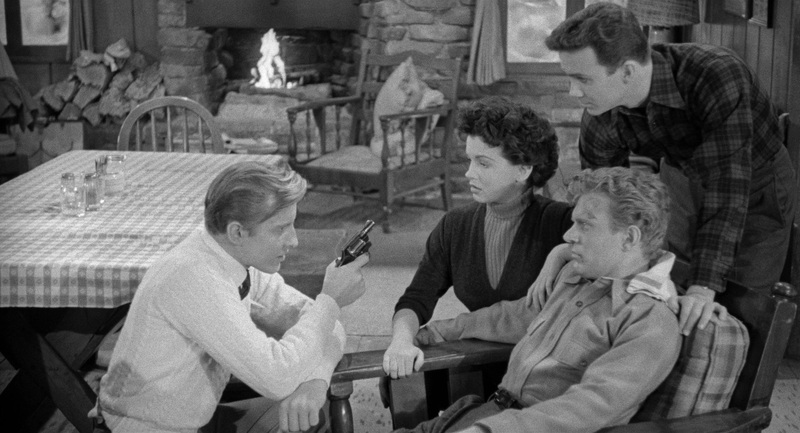 Newly remastered in 4K from the original camera negative, A Strange Adventure easily ranks among the most stunning home video releases of a film noir to date. Aided by skillful authoring, its exceptionally fine, filmic sheen has been reproduced beautifully. Detail and clarity consistently dazzle, and contrast is dead-on. This presentation is immaculate, not marred by any wear or damage of note. What Paramount Pictures Archive and Kino Lorber Studio Classics have accomplished here has genuinely left me in awe. Given A Strange Adventure's lean 70 minute runtime and that this isn't exactly an overstuffed special edition, it ought to go without saying that the film arrives on a single-layer Blu-ray disc. The flipside of the case lists an aspect ratio of 1.66:1, but it's instead slightly letterboxed to 1.85:1. A Strange Adventure's 16-bit, two-channel monaural soundtrack leaves similarly little room for complaint. The lossless audio is consistently clean and clear from start to finish. Aside from some unsurprising sibilance, there's nothing at all that I could point to as a flaw or concern. Again, extraordinary. The only other audio option is a commentary track. Audio Commentary: Film historian Toby Roan contributes a lively, well-researched commentary. He's limited somewhat by the fact that A Strange Adventure isn't some seminal noir with a wealth of material to draw from, with few details specific to its development or production to relate. Roan more than makes up for that with context, speaking about other armored car heist movies from the era, most every location used throughout the film (nearly all in close proximity to Republic Pictures' offices) and what stands there these many decades later, and a staggering amount of detail on the cast and crew. Among the highlights are A Strange Adventure sharing a double bill with Godzilla: King of the Monsters, that composer R. Dale Butts was once married to Dale Evans and after their divorce scored a number of her films with Roy Rogers, Joan Evans getting her name from godmother Joan Crawford, and the history of that '39 Mercury hot rod. 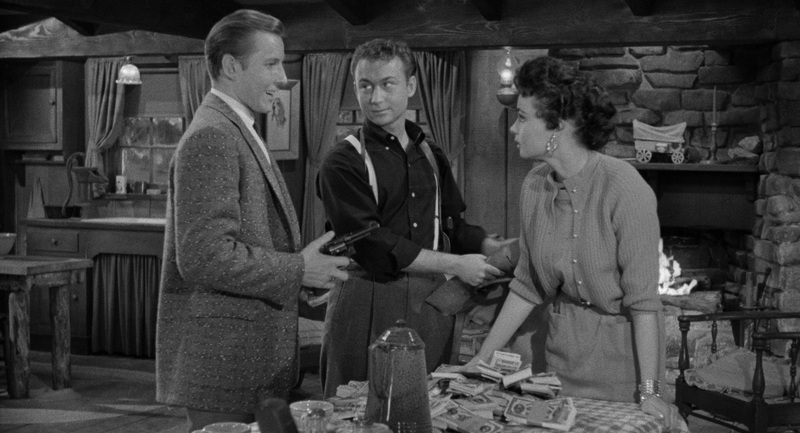 Roan also reads aloud from a letter written by Nick Adams shortly after filming wrapped, revealing the film's working title in the process. Jay Dee Witney, the son of director William Witney, also makes a brief appearance. Also included is a selection of trailers for other films noir that Kino Lorber has brought to Blu-ray. 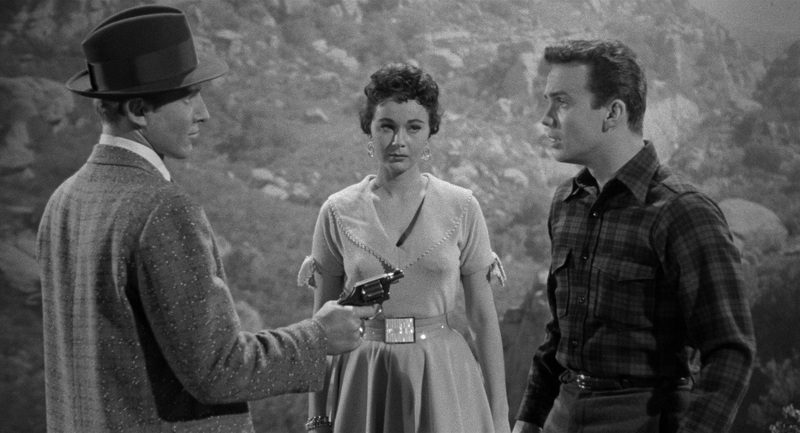 A Strange Adventure boasts what is beyond any doubt one of the most exceptional presentations of a film noir on Blu-ray to date. Shame about the movie, though, which I can't recommend as a purchase sight-unseen. For completists and established admirers only. Rent It.